For a pleasant adventure with lupines, it pays to winter-sow the seeds. Unlike greenhouse-grown plants, those sown outdoors in milk-jugs grow up to be sturdy and healthy. They are also more likely to accept the local climate. They’ve certainly accepted the heat and humidity of my Northeastern (zone 5-b) garden. Give them at least 7 hours of sun early in the day, followed by shade or filtered light in the afternoon. 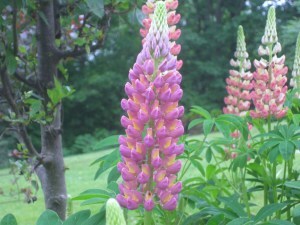 Here, lupine thrives in full sun from 6 AM until 1 PM. A crabapple tree, located behind the plants, protects them from the harsh, mid-afternoon glare. Rich, well-draining soil, one inch of water per week, and a mulch covering are other essentials. Before transplanting my seedlings, I loosened the bed to a depth of 8 inches, and mixed in copious amounts of leaf mold. Leaf mold retains many times its weight in water — a real blessing for we who dwell where summers are hot and droughts are common. A two-inch layer of mulch provides further insurance against dryness. I use composted woodchips, which almost anyone can acquire for free, for mulch. Between the decomposing mulch and the leaf mold, the plants receive all the food they need. If you want your plants to reseed themselves, don’t deadhead the last of the flowering spires. Ripened seeds will fall to the ground naturally. In spring, I simply transfer these volunteer seedlings to other areas of the garden which I think will benefit from a rainbow of color. If you lust for Lupines, but they have disappointed you in the past, be sure to try my cultural technique. After all, I’d like you to experience a luxurious month in the Land of Oz, too! The plants are perennial in USDA zones 3-8. 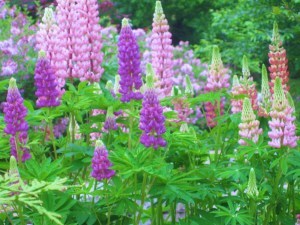 Whenever I see or hear about lupines, all I can think of is a certain Monty Python sketch. LOL! 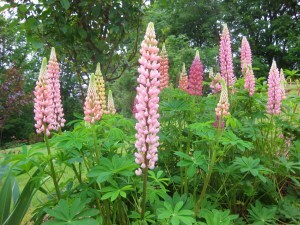 I've always wanted lupines in my own garden (due to the Pythons)but have never added any. This winter I must give them a try! snowflake – Thanks – glad you like them. I winter sowed a few this year, and ended up with two that seem pretty hardy–though just about 10 inches tall. It's good to know that next year I may have a real show! Stephie – Did you plant the 'Russell' strain? You'll probably get a few teaser blooms this summer. Then next summer…SHAZAM! 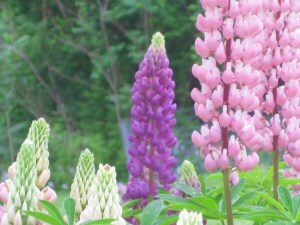 BBI – I agree — you can't have too many lupines. I checked out the book you mentioned — very, very sweet. Miss Rumphius is one of my favorite books, which is why I try to grow them. I too wintersowed them last year and only had the greenery appear. Nothing came back this year…. just more weeds. eck. erin – I hope you'll winter-sow the seeds again this winter. Then, at transplanting time, follow the steps for adding leafmold and a thick layer of mulch. I think you will find, as I have, that this cultural routine makes all the difference! I planted wildflower seeds 5 years ago and I was surprised to see a few lupine pop up at the end of last summer. This year I have about 10 huge plants…..they are almost taking over the garden! No complaints though. I wintersowed Russell lupines and blue lupine this winter. Just planted them into the flowerbed this week as a matter of fact. I hope they transplant well because I have a feeling I have planted them in the wrong place! I planted them in front of Jacob Cline Bee Balm. Reading article tells me that I should have planted them in back flowerbeds, where they would get morning sun and shade in later afternoon. Gardening is all about trial and error but boy! does it teach you a lot of things! I will put down the mulch around them tomorrow. What's the secret to getting them to stand erect when you first plant them? Do they transplant well? Guess best time to tranplant would be in the Fall? Daniel – I agree…who can complain about too many lupines? Pippi21 – Your winter-sown lupines should accept transplanting at this time without a hitch. Just keep them watered while the plants set new roots in their new quarters. They should stand erect, too, when new growth begins. Lupines are tough plants — with a thick layer of mulch around them (be sure to water deeply before laying this down) they probably won't faint in the afternoon sun. When you say winter-sow, what month are you referring to? I started some this spring in April. They are just about an inch tall now, have a few true leaves, but already have roots coming out of the bottom of the 4″ pots. I have a bed prepared for them. How far apart shall I plant them? Kevin, I have some lupines that are being crowded out by other plants I don’t want to move. Is it a very bad idea to transplant them now, in late July? Thanks! I planted a nursery plant 3 summers ago, I still haven’t had any blooms. Not even one spike. It is planted in full sun morning till about 3. Should I move it or is this just a late bloomer. The plant is huge and very healthy. 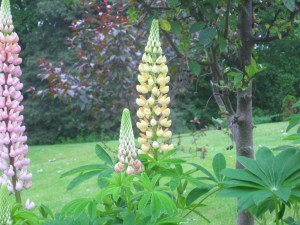 Hi Sherry – My lupines (from winter-sown seeds) have always bloomed by their second year. Can’t imagine why yours is taking so long! In any event, if the plant looks healthy, I’d leave it where it is. Maybe it will surprise you this season.